The armchair Louis XV style is an antique furniture occupying the role of seat, the style appeared in the eighteenth century, at the time when furniture holds an important place, the Louis XV armchair is a seat with light and practical back. The seat Louis XV style is a baroque seat upholstered in a black velvet fabric studded with old nails upholsterer, on a frame in black lacquered solid beech. 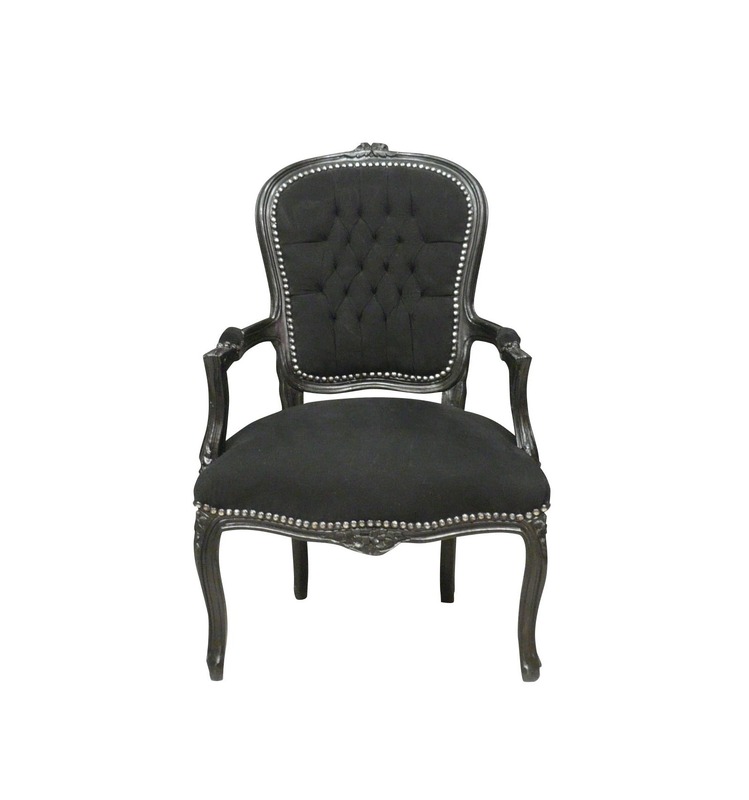 Its base consists of four fluted legs, ending in a snail elbow, its arched backrest characterizes the Louis 15 style. No matter where you sit in your living room, certainly, this old chair will give you real moments of happiness and relaxation thanks to their soft and comfortable padding. Added to this are its high rectangular backrest and armrests well stocked, barded by fabrics of the same matching tone. This reproduction is handcrafted using old methods with pegs, tenons and mortises. 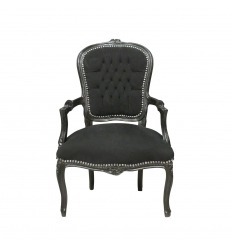 The Louis XV armchair in black velvet is an antique style living room furniture, made of noble materials, but combining elegance and comfort for a luxury decoration. It is a model of reference, symbolizing the high society and the family of the nobility, allowing to furnish a living room in the most refined way. The suspension is supported by elastic straps.